Del Mar will take on a bit of an international flavor this summer when Mark Casse sends a number of normally Canada-based horses to the seashore. The six-time Sovereign Award winner as Canada's top trainer expects to have as many as 40 horses at Del Mar during the season, many on the grounds right from the start and others arriving later. "We'll have a lot of young horses there, many with prospects for running in the Breeders' Cup," Casse said by telephone from his headquarters at Woodbine in Toronto. "Some of them will come directly from our training facility in Ocala (Florida) and some will be coming directly from Canada or from our string at Churchill Downs in Kentucky. The young horses will be ready to run. "This will be a new experience for us and we're excited about being there. My wife, Tina, and some of the family will be with us for the summer." The 53-year-old native of Indianapolis has trained two Canadian Horses of the Year in Sealy Hill and Uncaptured. He went a step further in discussing his Del Mar prospects by saying, "We're hoping to have the kind of success that will open the way for a year-round presence in Southern California. I'd like that a lot." Even though he insists his prime racing home would remain in Toronto, he says he'd like his stable to reach out to include several major racing venues in the United States. His stable numbers have grown enough to warrant that kind of outlook. Already, the stable has a major presence in Florida, both in racing and training, and in racing in Kentucky. Adding Southern California to that mix would be quite a coup for Casse. The location of his large training center in Ocala enhances the matter even further. "Our training center is practically across the street from the Ocala airport and there are flights leaving there for the West Coast all the time," he said. "Obviously, that makes transportation easily available." Among the young horses ticketed for Del Mar are Unbridled Reward, who was second in Churchill Downs' Debutante; Skyway, third in Churchill's Bashford Manor for two-year-old; and Conquest Tsunami, who could be a prospect for the Del Mar Futurity. Among older horses that figure to be at the seashore are three-year-olds Conquest Titan, who was on the Triple Crown trail earlier in the year with appearances in the Holy Bull Stakes, Tampa Bay Derby and Arkansas Derby; Dynamic Impact, winner of the Illinois Derby who finished seventh in the Preakness; three-year-old fillies Sky America, Lexie Lou and Zensational Bunny, four-year-old filly Spring in the Air, five-year-old mare Sky High Lady and six-year-old mare Sisterly Love, owned by Southern Californian Gary Barber. She defeated multiple Grade 1 winner Emollient in Keeneland's Doubledogdare in April. Chief among Casse's clients are his longtime regular John C. Oxley, Barber and Conquest Stables. Casse won't be a complete stranger to Del Mar. He came to the seashore in 2013 to run Delegation in the acific Classic, finishing sixth to multimillionaire Game On Dude. Actually, Casse had planned to send a whole string to Del Mar for the 2013 meet but an outbreak of an equine illness at Woodbine put a quarantine on the horse population there. Reigning as Casse's most decorated runner is Sealy Hill, who was not only Canadian Horse of the Year in 2007, but also champion in that year's three-year-old filly and turf filly and mare divisions. During that championship year, she became the first to sweep Canada's Triple Tiara for three-year-old fillies -- the Woodbine Oaks, Bison City and Wonder Where. Sealy Hill's exceptional accomplishments on the track were not without some grief along the way for her trainer. "Most of the time she was her own worst enemy," he said. "Her mood swings and antics changed from minute to minute. You never knew which direction she was going to go, what she was going to do. At times, she was more concerned with running over the competition than actually running by them." Casse grew up in in racing. His father, Norman, owned, bred and trained Thoroughbreds in a 40-year career, retiring as chairman of the board of Ocala Breeders' Sales Company in 2006. Son Mark became thoroughly hooked on the game at the tender age of 12 after a van ride with his Dad to witness the great Secretariat win the 1973 Kentucky Derby in track record time. At 15, Mark began running his father's Cardinal Hill Farm and started training officially at 18. He won his first race in 1979 at Keeneland. 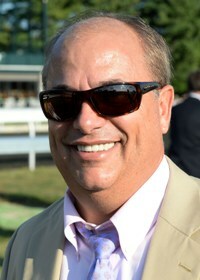 Casse, whose son Norman, named after Mark's father, represents the third generation in the business, handles the stable's Kentucky string that races at Keeneland and Churchill Downs. The youngest of the seven Casse children, Colby, gives the impression that he might well join his father and brother in the Thoroughbred life. Says his father, "He doesn't pay much attention to football or basketball or baseball, but he can make all the calls on Breeders' Cup races, so I guess he might follow us into the business." Casse gives considerable credit for the stable's success to his wife, Tina, who handles all the business matters. "Tina does all the day-to-day business stuff and that allows me to give all my attention to the horse side of things," the trainer said. "That goes a long way toward ensuring our success." Speaking of success, Casse surely has had his share. He's been the leading trainer at Canada's premier venue, Woodbine, eight different times, including the last seven years in a row. He currently leads the meet there once again and earlier this month pulled off a victory in Canada's top race for three-year-olds, the Queen's Plate, with the stellar filly Lexie Lou, who races for Gary Barber. This past spring, Casse was the top winning trainer at the Keeneland meet. Further, he has won more than 1,700 races and has posted purse earnings of over $85 million. He appears clearly eligible to be a force at the Del Mar 2014 meeting.